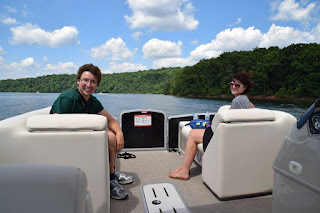 We continue our explorations of the Raystown Lake area with a boat ride to see the largest lake within Pennsylvania's borders. We were treated to a tour by Pam, the owner of Seven Points Marina, a family institution that has been in business at Raystown for generations. They operated marinas on both the old lake, and the new one. She took us out on one of her brand new, 150 horsepower pontoon boats. It was quite a treat getting a personal tour from someone who has grown up with the lake. Her marina offers a wide variety of boat rentals, including speedboats, pontoons, and a fleet of houseboats. This is the only place in Pennsylvania where the houseboats are navigable and available for rent. There are seemingly endless possibilities for recreation on this enormous lake. Also available at the marina are kayak rentals. There are some campgrounds along the lake that are only accessible by way of water, making for an awesome adventure. 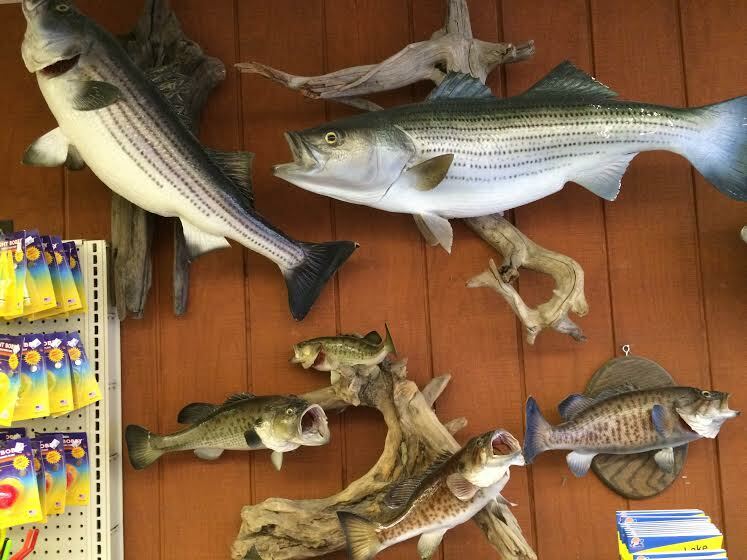 Swimming, fishing, sightseeing, and more, await those who visit Raystown Lake. Some of the fleet that is available for rent. In the background you can see the steep shoreline, consisting of the Juniata Valley, deep in the Alleghenies. This setting makes the lake very distinctive, almost reminiscent of some of the giant lakes out west, like the Hoover Dam's Lake Mead, and the Glen Canyon Dam's Lake Powell. The recreational opportunities and scenery are reminiscent of those lakes, with the landscape of the most rugged sections of the Alleghenies. The scenes at the lake are truly a sight to behold. The marina is a hub of activity. They also offer personal boat launching here. On this hot day, people were flocking to the lake to cool off in this mountain setting. There is a huge school of carp that sets up camp near the shoreline. Natural fish food is provided and the fish are an attraction of their own. Brit having a blast on the pontoon boat. Pam is on the left, and Ed of the Huntingdon County Tourism Bureau is on the right. This brand new pontoon boat was something else. The boat was extremely stable, and powerful. The 150 horsepower engine was terrific, and the boat was able to cut right through any waves in the water. The few clouds in the sky looked awesome over the water. The shadows on the lake and shore looked absolutely stunning. One of the islands around the lake. There were a number of houseboats that were moored at the island, and people were exploring it, as they were at places all over the lake. These islands are the tips of submerged elevated areas in the section of the Juniata Valley occupied by the lake. 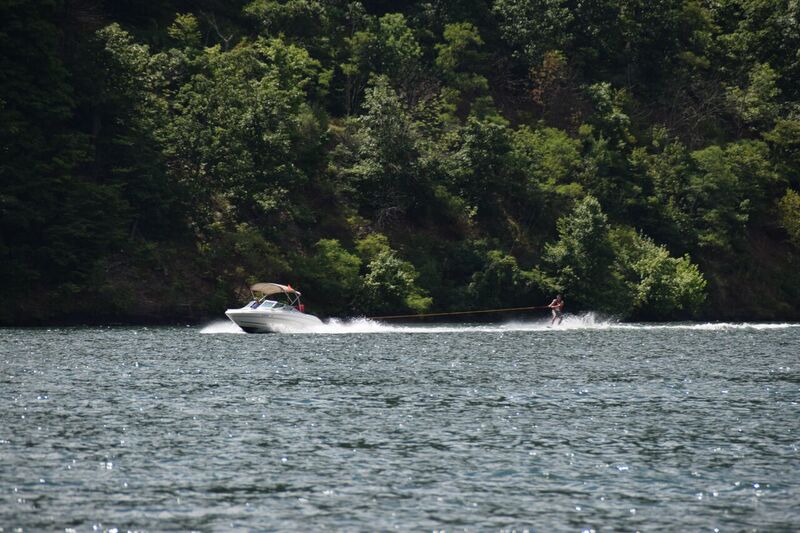 Just about every water recreational activity you can think of can be done at the lake. Even with all of the people out on the lake, things were still peaceful and serene, given the extreme size of the lake. 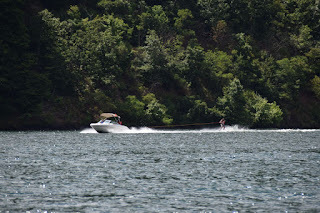 A boat pulling a water skier. Photo credit to Ed Stoddard. Cruising around the islands, Pennsylvania style. One of the lakeside campgrounds. There are mile markers set up throughout the lake. Over a hundred miles of shorelines exist around the lake, with seemingly endless recreational opportunities awaiting. Only four percent of the land around the lake is developed, with the remainder of it being wilderness. The two of us having a blast! There are a number of protected no wake zones that are hubs for kayaking, canoeing, fishing, and more. There are a few visible vestiges from prior to the lake's construction that are visible, including this guardrail from a dead-ended street. The boulder formations in this section of the lake are spectacular. This area was filled with people fishing, floating, sunbathing, swimming, and more. Brit having a great time on the lake. The Old Loggers Trail is a sought after hiking trail. It leads towards Sheep Rock, an geological gem that is also an archaeological wonder. It was a rock shelter for early native american people. Artifacts that were excavated from the site are located at the State Museum in Harrisburg. Near the water line, you can see the rock begin to overhang. The archaeological site was flooded out when this incarnation of Raystown Lake was made. Pottery, spearheads, knives, 6000 year old human remains, and more were found in the archaeological site. Thanks to the shelter setting, a number of organic remnants were left, something relatively unheard of in the moist climate of Pennsylvania. Notice the layering in the rock. Pam invited us to take a swim. Brit took her up on the offer! This view really captures the idyllic beauty of Raystown Lake. She certainly did not regret going for a swim! Now approaching the Seven Points Marina, the largest marina in Pennsylvania! The pontoon boat on the right is available for rental, and it even has a waterslide! On our way out from our afternoon on the lake, we stopped to pick up some hoagies for lunch at the Seven Points Bait and Grocery's Deli. They have a number of the trophy fish hung on the wall that have been caught by regulars at the store. Oh yeah, and the hoagies? Fantastic! 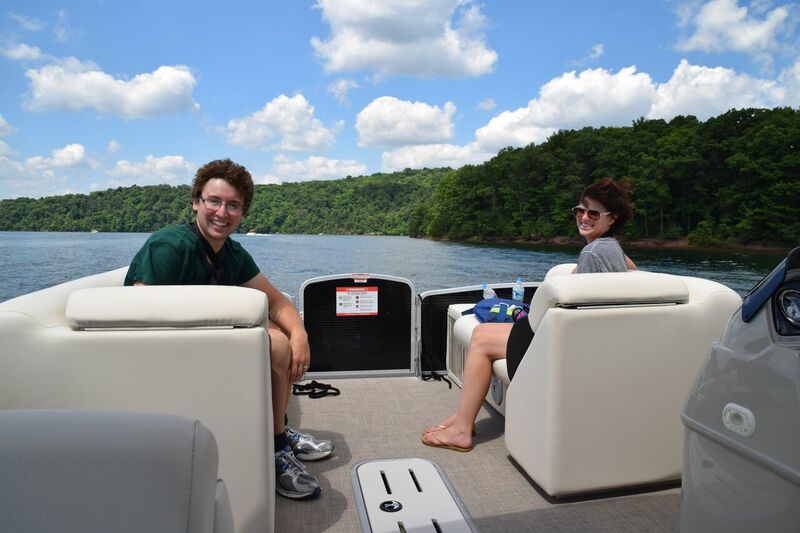 It was great going out for a ride with a tour of Raystown Lake by Pam from Seven Points Marina. It is clear that she has grown up with the lake for her passion for it really shows through. Her family's involvement in the area spans seventy years. Her marina offers a little bit of everything for everyone. A wide variety of rentals, including houseboats, speedboats, pontoons, fishing boats, and more are available. Launching and docking is available for your own boats. If you are not a boater, the marina has plenty to offer to you as well, with their Princess Lake Cruises that give narrated and catered sightseeing cruises across the lake. Sightseeing is also lots of fun from the marina area, looking out over the lake. Feeding the carp and relaxing at the marina is a ton of fun as well. 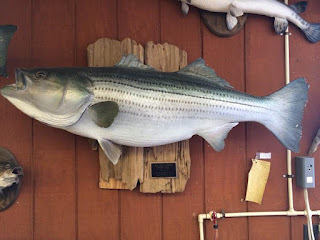 Overall, Raystown Lake is a place that you need to go check out. We will continue our journeys around the lake and through the region in upcoming articles. We were hosted by Seven Points Marina and the Huntingdon County Tourism Bureau. We have included our opinions within this article.